Key to the success of the V is the new Wavelet Processor. Wisely, Legacy left behind the generic Xilica processor for a new component dedicated for use with its speakers. The Wavelet now performs a suite of functions, including control preamp, premium DAC, digital crossover with time alignment for each driver section, and acoustic correction system that the manual states “… will literally ‘learn’ your room.” A source, either analog or digital, can be input directly to the Wavelet and sent on from it to the amplification of one’s choice. Owners of the old Xilica are urged to upgrade for a sure performance boost. The Legacy Wavelet Processor sports a pleasant flat black aluminum chassis with a large powdered aluminum silver volume wheel on the right and a line of diminutive push buttons to the left of the oversized blue LED display. The functions are selected by push buttons with corresponding blue LEDs. Input, Mode, DAC Preset, Mute, Contour, and Channel Level are also found (among others) in the Legacy remote control app. These functions as well as the Bohmer correction features are discussed below. It is sensible that these functions are redundant on the unit itself should the Legacy online app remote functionality not be accessible (i.e. your tablet hosting the Legacy remote app is out of commission). The large blue LED display is gloriously grand sized and dimmable. A word to the wise: the action of the volume control on the Wavelet is compounded the longer it is depressed. Care should be exercised that one does not depress the button too long when bringing up the volume or else enormous leaps in level are possible. Setup of the Wavelet requires online access, which in my case necessitated using Internet over power line devices I had installed in my home previously. When I built my listening room I encased it with resilient channel to decouple the ceiling and walls from the studs. The result was that I built a vault; I cannot push a wireless signal through the walls even with signal boosters just outside and inside the door! I wired the room for online connectivity, but over time a breach in the connection occurred and I have not been motivated to tear into the massively overbuilt room to find it. Consequently I tried what seemed a desperate measure, a power line internet signal carrier, a set of converters that pony the main computer’s internet signal from the desktop to wherever in the home remotely one wishes to receive the signal. It works, and works beautifully, without carrier noise! I use the receiving unit’s hard connection inside the listening room, connecting to the Salk Audio StreamPlayer III, discussed below, as it has no Wi-Fi operability. I now daily employ Tidal as a source and Roon music interface with results bettering any CD player regardless of cost that I have used. During my time with the V, I had the pleasure to review the Salk Audio StreamPlayer file server/streamer. Set up with both Roon and Tidal, I have found it to far surpass my previous Mac Mini setup with HQPlayer software. Normally I consider alternative power options for components, and the StreamPlayer and Wavelet were no exceptions. I do, however, make one sizable exception to the treatment of a system’s power. I don’t typically like “all in one” power regeneration or conditioning solutions. I find them, as a lot, to hinder as much as help the system’s sound. I am content with many of the smaller, component-specific solutions in terms of power upgrades. The Exogal Comet DAC (reviewed) benefits nicely from its own upgrade power supply, the PLUS. The StreamPlayer’s performance was lifted by the addition of the HD-PLEX 100 Watt Linear Power Supply ($395), and the Wavelet, too, showed improvement through use of this affordable power supply. The HD-PLEX can be ordered with one or two supplies in a single chassis. Seeing the potential to influence both the Salk and Legacy products, I elected to treat both with the HD-PLEX. It can be configured to provide the proper voltage for the components at hand, in this case 19V for the particular StreamPlayer III on review (I believe that Salk Audio may have made a change to the current StreamPlayer III to a 12V input; check with Salk Audio before ordering an HD-PLEX unit) and 12V for the Wavelet. In my experience, adding on a component-specific complementary power supply is all but assured to improve the system’s sound. However, once in a while the particular configuration of the system prevents success. There are occasionally incompatibilities between components not at all due to inferior design or performance but due to differing parameters of operation. The HD-PLEX turned out to be propitious when set up with the Wavelet alone but problematic when used with both the Wavelet and the Exogal Comet as an outboard DAC feeding the Wavelet. It should be noted that I took the time to try five different power configurations for this speaker system. Were the power configuration for an audio system of marginal importance I would not spend my time on it. However, it is so important, being especially noticeable in upper end systems, I am willing to run down several alternatives to find the best one. If you have paid scant attention to power cabling and component-specific power supply upgrades then you have not finished your job as a builder of an ultimate system. You are completely off base if you dedicate time to ancillary tweaks, such as cones, bowls and weights or similar, and neglect the power. I would be falling short of the goal of the most thorough and appropriate review of the V if I did not pursue this element of setting up its Wavelet processor. Only one of the configurations, the fourth, was not beneficial. The system improved in all other instances when this outboard power supply was used with the StreamPlayer III or the Wavelet. However, when the HD-PLEX was connected to both the Wavelet and StreamPlayer III and the Exogal Comet was in use, I could not get sound from the system. Punctiliously checking and re-checking the connections, making sure Tidal and Roon were operational, the rig simply would not produce sound when all three were joined. At no time did any component default and no noise was emitted – it just didn’t play music. If I took out any one piece, the system would operate at a sound quality superior to the stock configuration. Regardless, have I used the HD-PLEX ongoing? Absolutely! It is an efficacious part of the best systems I can build with the V. As aforesaid, its use with both the StreamPlayer III and Wavelet can be recommended. The external DAC seems to have been the wildcard. Bill Dudleston is not too excited about placement of an external DAC into the system with the Wavelet. I am receiving mixed messages on this; at least one V owner I know recommended the addition of an external DAC as a necessity and urged me to try it. Would it enhance or limit the performance of the Wavelet? My goal in much of the remainder of this review is to produce stimulating thought to fire your imagination as I explain what I discovered about making the V an unstoppable force. I will discuss not a “meaningful” or “significant” improvement to the V’s performance, but an explosive – yes, volcanic ­– performance improvement. If the V is set up optimally it becomes competitive with the largest models of the brands mentioned in Part 1 that are multiples more costly than the V. I entitled this section of the review “Vigorous” because, as far as speaker systems go, the Wavelet processor is much more flexible in setup and the V far more vigorous in performance potential than most top-flight speakers. The Bohmer system works remarkably well. The procedure Setup is controlled from the Legacy (Bohmer) online remote. First, all channels are “pinged” with white noise to ensure the connections are correct, then the room correction begins in earnest. One speaker at a time, the Wavelet sends frequency sweeps to be picked up by the microphone. The Wavelet forwards them to a supercomputer in Sweden for heavy number crunching (how exotic is that?) and when finished the individual speakers are calibrated and the room correction turned on. Note that correction can be defeated via the remote control. The calibration operates no matter what adjustments are made by the user via the Contour controls for Bass, Treble or Punch. Toggling between the on and off positions of the Bohmer Correction was not much less dramatic than flipping a light switch on or off. The lower foundation of the music collapsed and the bass went M.I.A. without the Bohmer correction. With the correction I heard startling impact and precision that reminded me of how of some manufacturers use smaller bass drivers in an attempt to keep the bass under tight reins. When that is done with smallish bass drivers I can’t get past the “popping” effect as they attempt to generate serious LF. In this instance, however, as the V utilizes several 12” and 10” bass drivers, the popping characteristic contained muscularity, a significant tactile strength, and thus did not seem foreign to the overall experience. 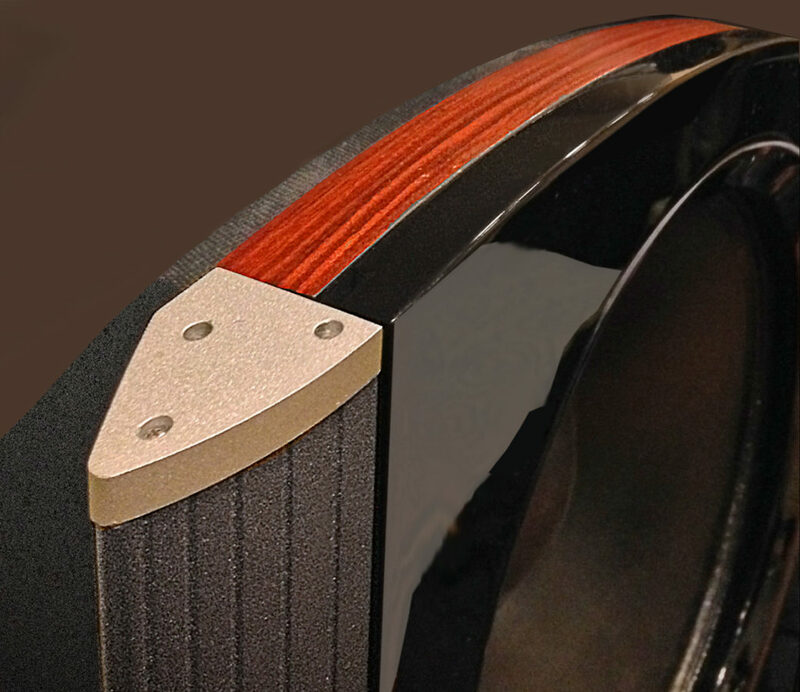 Some of the other speakers in the listing in Part 1 allow you to adjust the tilt of individual modules. What they don’t tell you is that you are screwing around with the time alignment of the drivers when you pull them in and out and/or rearrange their baffle slope. This not only influences the action of the one driver but the interaction of all of them. The odds are that the owner will not hit upon optimum performance through such adjustments. Conversely, the V does not allow you to adjust such things, but it is time aligned in the digital domain. Would you really want to mess that up? It is certainly not a negative that the V has the drivers fixed in their locations. Doug,…this an outstanding review of the V and Wavelet; this system needs to be experienced with the depth and the care you have given it to be fully appreciated. It stands with the absolute finest speakers regardless of cost in the high-end audio world, and like the AERIS + Wavelet, has IMHO, the best ROI in the audio world!!! Doug,…I have to say that I only heard the V once in a showroom. As you said in your review, I also thought from left to right how I could afford to get a pair for my home. But financial restrictions allowed “only” for an Aeris. To get to know the Aeris I flew from Germany to Chicago (AXPONA 2015)! I met there Victoria, Bill and Doug ( who retired lately). That contact did not only convince me to buy an Aeris for my home, but it let me become the distributor for Legacy Hifi-speakers in Germany. 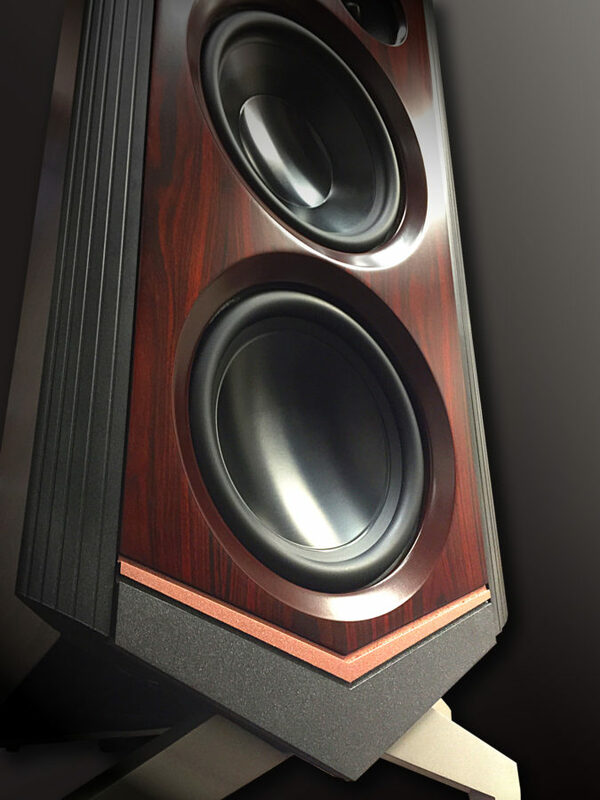 So you might call me “biased”; but that is only true due to the performance of the speakers. I can fully underline your thoughts about the Wavelet. Initially I got my Aeris with the Xilica processor, which was hard to set up for someone who has not the knowledge of Bill. The switch to the Wavelet was a relief both in set up routine and listening experience. I loved my PS Audio DS DAC, but after trying the Auralic Aries directly into the Wavelet I let the DS go. I use the well build jCat USB cable with the Audioquest adapter as recommended by you. To ease the mechanical force on the tiny USB socket I laid a small wooden block under the adapter. I will today check your suggestion concerning the upsampling via Roon; but even without that tweak I´m a happy camper with my Aeris. One note on your amp-experience: Yes, the powerbloc gives a lot SQ for a small amount of money. But even Bill suggests to use different amps if money allows. I followed Bill´s advice to buy me a a pair of Coda Tm for my Aeris. These amps are a “match in heaven”, at least with the Aeris. The only concern I´m still struggling with is how to get more HiFi-hobbyists in Germany in contact with the Legacy speakers. If sound quality was more important than marketing budgets, Legacy would be a leading brand in Germany! It seems you have done quite well with your speakers, congratulations! I’m glad the Audioquest adapter idea was helpful. Regarding other amps, see my review of the AVM Ovation SA-6.2 Amplifiers, which were marvelous with the V.
I must say this is one of my favorite reviews due to the diligence and investigative fervor displayed. I have a pair of Focus SE speakers, using the Powerbloc2 as amplification. It is a marvelous pairing, and I think there is something special, though not intuitive or logical, in applying a powerful amp to efficient speakers. There is an effortlessness and ease which is addictive. I am intrigued by the Wavelet, and have no doubt the DSP is fabulous. Are the DAC and preamp sections up to that quality? Is MQA incompatible with DSP? Thanks again for your insights. Thank you for the complement. I consider the DAC and preamp sections to be of very high quality and quite suitable for obtaining a high end result. Regarding MQA, though the Wavelet is not at this time MQA capable, my understanding is that MQA songs could be played, though not “unfolded” entirely.